Aliosso High End Flower Stand has brown walnut veneer with Turpinia Burl details finished in clear high gloss lacquered top and frame finish with silver polished stainless-steel details. It is available in three sizes. Aliosso High End Flower Stand has brown walnut venner with Turpinia Burl details finished in clear high gloss lacquered top and frame finish with silver polished stainless-steel details. It is available in three sizes. Aliosso High End Flower Stand by Roberto Grassie has brown walnut veneer with Turpinia Burl details finished in clear high gloss lacquered top and frame finish with silver polished stainless-steel details. It is available in three sizes. 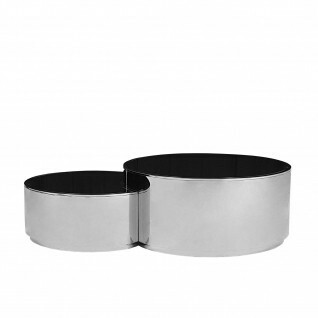 Otello Modern Round Coffee table has a 12mm tempered black glass and a silver polished stainless-steel base. 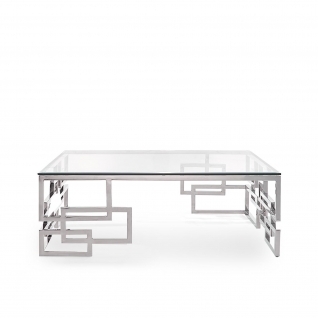 Spectra Modern Rectangular Coffee Table has a geometric shape base crafted with a silver polished stainless-steel base and a 12mm glass top with a 1” bevel. 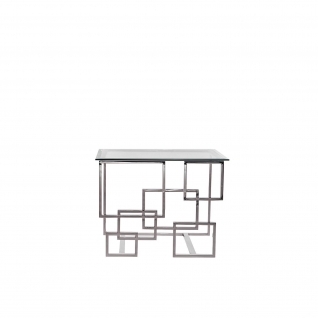 Spectra Modern End Table has a geometric shape base crafted with a silver polished stainless-steel base and a 12mm glass top with a 1” bevel. 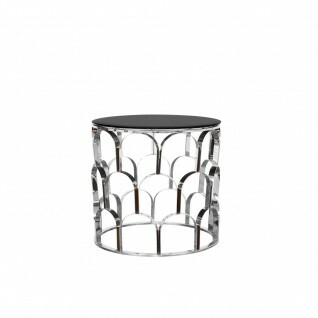 Sequenza Luxury Round End Table features a black 12mm beveled black glass top with silver polished stainless-steel base.